B'é Benjamin Harrison IV (20 Lúnasa, 1833 – 13 Márta, 1901) 23ú uachtarán Stáit Aontaithe Mheiriceá. Bhí sé i bhfeidhmeannas ó 4 Márta, 1889 - 3 Márta, 1893. B'é William Henry Harrison a sheanathair, 9ú uachtarán na Stát Aontaithe Mheiriceá. 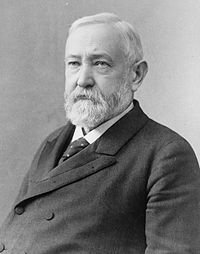 Rugadh Benjamin Harrison i North Bend, Ohio ag John Scott Harrison (níos déanaí feisire ó Ohio sa Chomhdháil na Stát Aontaithe) agus Elizabeth Ramsey Irwin. D’fhreastail Harrison ar Ollscoil Miami (Oxford, Ohio). Bhí sé ina bhall de Phi Delta Theta, bráithreachas san ollscoil. Bhain sé céim amach i 1852. Thosaigh Harrison ag obair mar dlíodóir i Cincinnati, Ohio, agus d'aistrigh sé do dtí Indianapolis i 1854. Brú ar mhaithe le caomhnaitheacht. Thacaigh Harrison, agus an Comhdháil na Stát Aontaithe ag an am, srianadh trádála. Feisire sa Chomhdháil, agus cosantaí, ba ea William McKinley. Thóg sé taraif custam isteach sa bhliain 1890. Reachtaíocht in aghaidh trustaí. Shínigh Harrison an dlí Sherman in aghaidh trustaí ar an 2 Iúil, 1890. Impiriúlachas. Tháinig Hawaii faoi thionchar na Stáit Aontaithe. Níor atoghadh Harrison ina uachtarán sa bhliain 1892. Tugadh an leathanach seo cothrom le dáta an 18 Márta 2018 ag 21:18.